Paul Manafort To Testify On Russia As House Intel Committee Drama Continues : The Two-Way It's unclear when Trump's former campaign chair will speak. Meanwhile, the next open hearing is either postponed for logistics or canceled over Democratic objections — depending on whom you believe. Devin Nunes, R-Calif., chairman of the House Intelligence Committee, speaks to the media about the investigation of Russian meddling in the 2016 presidential election on Capitol Hill in Washington, D.C., on Friday. Former Trump campaign chairman Paul Manafort has volunteered to testify before the House Intelligence Committee, as turmoil within the committee continues and the future of the investigation into Russia's attempts to interfere with the election sunk deeper into doubt. In dueling news conferences Friday morning, committee Chairman Devin Nunes, R-Calif., said the committee had postponed its next open hearing for what amounted to logistical reasons — while ranking member Adam Schiff, D-Calif., said that hearing had been canceled over Democratic objections. Let's start with Nunes. Speaking first, he said that Manafort — who has been accused of having undisclosed entanglements with Russia, including allegations of million-dollar payouts from a pro-Russia political party — had volunteered to be interviewed by the committee. Nunes gave no details on when the conversation would happen, or whether it would be a closed or open hearing. He urged anyone else with information relevant to the investigation, which is looking into Russian meddling as well as the mishandling of classified information, to approach the committee. Since then, Roger Stone announced on Twitter he has volunteered to testify, and CNN reports that Carter Page has also volunteered. Both are Trump associates who have been under scrutiny — Stone for alleged collusion with Wikileaks and Page for trips to Russia, among other things. Nunes also said the committee had decided to ask more questions of FBI Director James Comey and NSA Director Mike Rogers, who appeared at an open hearing on Monday. This time, he said it will be a closed hearing. "There are just questions that we have ... that they just couldn't answer in a public setting," he said. "But it's necessary to get both of them back down here before we can move on to other issues." As a result, he said the next open hearing — scheduled for Tuesday, with Obama administration officials — was postponed to make time for the closed hearing. After Nunes spoke, Schiff came out and blasted the decision to call off Tuesday's hearing. 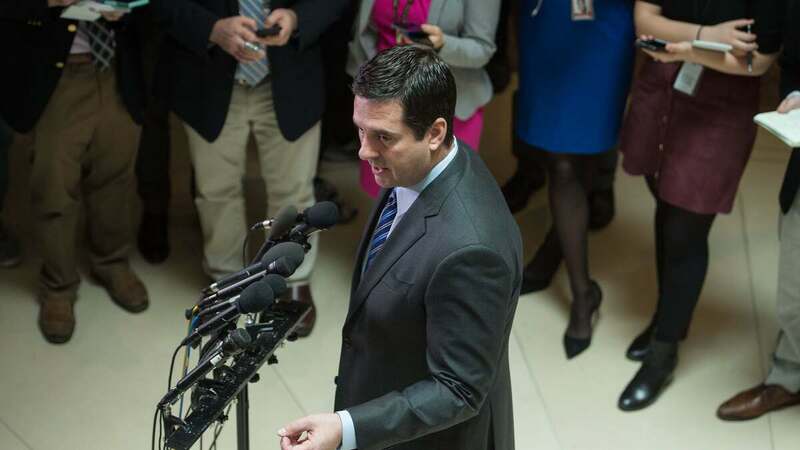 He said that Nunes' explanation, that they needed time to question Comey and Rogers, "is at most a dodge," adding that the committee could hold that closed hearing "at any time." "What really is involved here is a cancellation of the open hearing," Schiff said. "We strongly object," he said, speaking for the Democratic minority. As for why the Tuesday hearing was called off, "I think that there must have been a very strong pushback from the White House," Schiff said. "It's hard for me to come to any other conclusion." He welcomed the news that Manafort would testify, but called for it to happen in an open session if possible. Both Schiff and Nunes also addressed the issue of President Trump's baseless claims that former President Obama had his campaign under illegal surveillance. On Wednesday, Nunes held a surprise press conference to say he'd seen evidence that the Trump transition team had been captured in "incidental surveillance," which would not be illegal, but which Trump interpreted as "somewhat vindicating" his widely-rejected claims. On Friday, Nunes walked further away from Trump's position. "There was no wiretapping of Trump Tower," he said. "That didn't happen. ... It looks like this was all legal surveillance, from what I can tell," the chairman said, alluding to the mysterious evidence. That's not a different stance than he took on Wednesday, but it is a blunter one. Schiff, meanwhile described Trump's claim as a "slanderous accusation." He called Nunes' Wednesday conference a "peculiar excursion" that seemed like an attempt to bolster Trump, even though the evidence did not support the allegation. "That effort to defend the indefensible has led us down this terrible rabbit hole and threatens the integrity of the only investigation [into Russian meddling] that's authorized in the House," Schiff said.